Let me begin this post by saying you will learn nothing of actual value from the information I am about to share with you, other than my children are both blessed AND cursed. So my friend Mindy and I road-tripped to the MOA that morning with my toddler Brielle in tow, to get the newly released 7th book (which by the way, I had already ordered and had delivered to Logan at school on the day it was officially released – cause he loves ’em and I’m kind of a good mommy like that – but you had to follow the book signing rules to get a wristband to be allowed into the line. And I figure, you can never have too many copies of an awesome book). Unfortunately, Mindy’s son came home sick from school that afternoon, so being one of the best mommies ever, she loaded up all of his books in a bag and hitched a ride with Logan and I up to the mall that evening. I had an equally heavy bag of books I was hoping to have signed slung over my back. Thankfully, they had the WIMPY KID movies playing while we waited in line and before the second movie had ended, we had made it to the front. It was pretty much just the kids having their picture taken with Jeff, but Mindy’s son wasn’t there, so we snapped a couple of shots of her explaining to him why she was there without a child fan. When Jeff heard that her son was home sick, he told her to get him on her cell phone so he could say hi to him! Can you imagine, being 9 years-old, chilling on your couch at home and getting a phone call from one of your favorite authors?! Needless to say, he was beyond excited! Mindy getting her cellphone ready to make the call! When it was my son’s turn, and the lady directing the line told me where to stand to take a photo of Logan with Jeff, I asked, “Would it be weird if I got in the picture, too?” Her mouth said “No,” but I’m pretty sure her sideways smile said “Yes.” But whatever! I was not missing out on a picture with one of MY favorite authors/illustrators…not even if people were gonna look at me funny. Besides, I’m totally used to people doing that, so who cares?! There we are! They only had one x marking the spot for the kid to stand, so I wasn’t sure where to put myself. 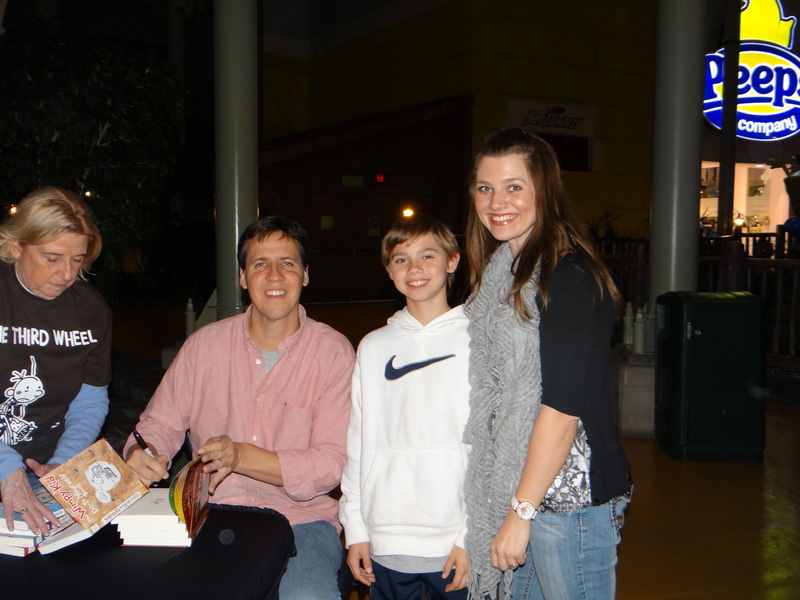 But when I tried to stand behind Jeff Kinney and give him bunny ears, the lady beside him put me in a headlock, so I moved a little closer to the x. Disclaimer: I totally made that up. That lady never man-handled me. All the people associated with the book signing were nothing but sweet! That was the first round of awesomesauce we had slathered on us last week. Now, to tell you why my kids are cursed to call me Mom. **Two things should be noted about the above information. 1) If you do, in fact, look in my windows in the mornings, that is creepy and you need to knock it off! and 2) My son has recently confided in me that he’s actually glad I’m not a normal mom, since normal mom’s don’t take their children ghost hunting (although he could probably do without the dancing). 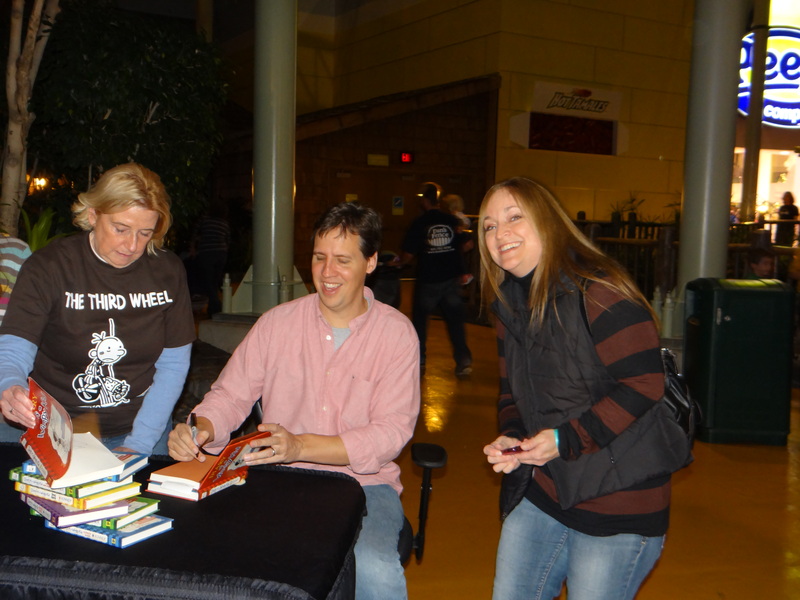 I’ll leave you with one last picture, because my dear, sweet friend, Mindy hates all of the photos I took of her with Jeff Kinney – apparently I’m not a gifted photographer and I kept capturing her in various states of looking silly. So I pinky promised to include a nice picture of her to make up for the one she finds unflattering (although, I’d like to say, I think she looks fabulous and whoever took that photo was clearly brilliant). Anyway, you know what happens if you break a pinky promise, right? You’re pinky falls off!! So in an attempt to keep all of my appendages, here is an adorable photo of me with one of my bestest friends! This is back when we were leading the charge of our kids’ PTO (PTA to anyone not in MN – hey, if we didn’t switch out the A for an O how could you hear our funky Minnesota accent when we say it). We kind of have that Co-President glow, don’t ya’ think?! Screenplays and Manuscripts and Outlines…Oh My! I can say all of those same sweet things about you! 🙂 When I look at that picture of us, I think “Hey, we look kinda hot as blondes!” We might have to switch back next summer when we’re all tan from lounging around your pool! 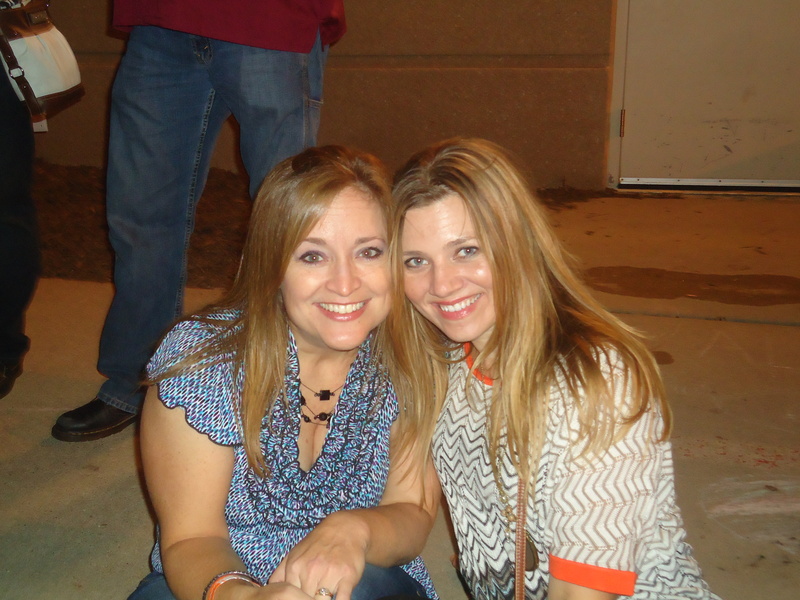 Love ya’, Mindy Falter!! I LOVE this post…hear hear on being a ‘kid’ with your kids. We’ve only got one life and we might as well get in there and live it. I have to admit I am the same Mom instigating these awesome and silly things! Keep dancing…ha ha! Cheers to moms who aren’t afraid to be a kid with their kids! So happy to meet ya’ in the cyber world! Hugs! continue your ցreat writing, havе a nice weekend!